Owner Ariena Thomsen, who’s originally from Northern Ireland, opened Thank Heaven in 2004 when her third baby was just six weeks old. Located in the neighborhood’s main thoroughfare of Austin St., this popular baby and kids’ boutique sells clothing ranging in age from newborn to eight years old. 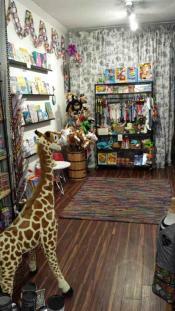 The store features European and American brands, including 3 Pommes, Lemon, Le Top, Little Giraffe, and Kissy Kissy. Parents will also find a selection of unique accessories and toys from brands like Bla Bla, which specializes in knitted dolls and blankets. This Sunnyside children’s boutique is the only store of its kind in the neighborhood, and has become so popular that local mom and owner, Jill Callan, opened a second location in Long Island City last summer. Both stores feature an eclectic mix of apparel and gifts from brands like Magnificent Baby, Apple Park, and Joyfolie. The store also features many items made by local designers such as Pitchoun Designs’ Lacy Obry, a Long Island City mom who makes girls’ hair accessories. Other unique merchandise includes hand-crafted kids’ jewelry and knitted hats and baby booties. Local moms Laurie Nicholson and Kimberly Rossignol Montini opened this kids’ and maternity consignment shop two years ago, and it’s since become a neighborhood favorite. The store maintains a wide selection of gently-used clothes for babies and kids, in addition to toys from independent brands like Hape Toys and Jack Rabbit Creations. The store changes its inventory seasonally and only sells items on consignment that are in excellent condition, so parents can save money while still getting quality clothing for their kids. Most of the items are from high-end outfitters such as Janie and Jack or Hannah Anderson, but the store will accept and sell items from popular brands like Carters or Children’s Place as long as they’re brand new and still have the tags. Looking for a Queens-themed onesie, or a locally-made “I Heart Astoria” bib for your little one? Look no further than Lockwood. Longtime local resident and neighborhood blogger Mackenzi Farquer opened the store last summer, and at 1,300 square feet, it’s one of the largest independently owned shops in the neighborhood. Lockwood sells all sorts of distinctive items—everything from houseware and furniture to artwork and jewelry. And the store’s kids section is one-of-a-kind, featuring locally-made clothing as well as decor, books, toys, dishware, and other items from brands like Spitfire Girl, Wonder Threads, Zutano, and Skip Hop.